After writing their names in football history at the ongoing FIFA World Cup in Russia, three of Nigerian players have been named among the best 11 eliminated. 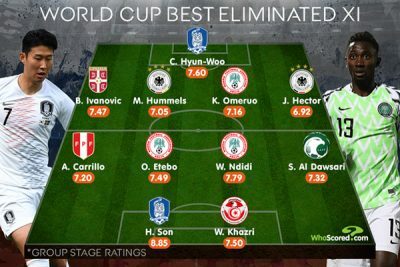 Super Eagles trio, Keneth Omeruo, Wilfred Ndidi and Oghenekaro Etebo have been included in authoritative football analysis and statistics website Whoscored.com’s best rated XI of players to have been eliminated from the 2018 FIFA World Cup in Russia. The Nigerian trio are joined on the list by notable names like Germany’s Mats Hummels and Jonas Hector, Serbia defender Branislav Ivanovic and Son Heung-Min of South Korea in the XI deployed in a 4-4-2 formation. Etebo, who signed for SkyBet Championship club, Stoke City prior to the start of the competition made a huge impact for the Super Eagles in Russia. The 22-year-old completed all but one of his 17 attempted dribbles and made a combined total of 14 tackles and interceptions. Only Lionel Messi and Neymar completed more dribbles than Etebo during the first round of games. Etebo’s midfield partner Wilfred Ndidi makes the cut with a hugely impressive showing for the Super Eagles. The Leicester star made more tackles (15) and interceptions (12) than any other player in the group stages of the World Cup to once more showcase his quality to the watching world. The Super Eagles were eliminated from Russia 2018 after a 2-1 defeat against Argentina in their final Group D game. 0 Response to "World Cup 2018: Three Super Eagles Stars Named In Russia 2018 Eliminated Best XI"